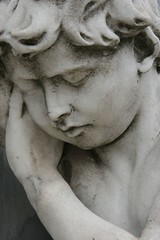 ... the truth is, I never left you - I'm just sleeping in Recoleta Cemetery. 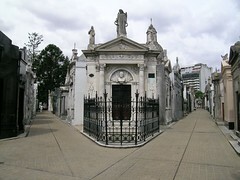 This Buenos Aires necropolis is truly mind-blowing, and budget-blowing if you want to spend the rest of eternity entombed in one of the thousands of marble-and-iron clad mausoleums here. 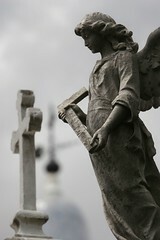 Never have I seen such a stylish cemetery. There's an excess of stone angels and cherubs weeping heaven-wards and the doors to the tombs are all heavily guarded (why?) with beautiful art-deco iron work. 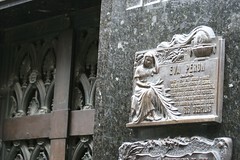 Argentina's most famous political diva Eva Peron is buried here, although apparently her body had to be snuck in under cover of darkness (not sure if that was to avoid paying or evade political foes). The place is also crawling with cats, spread out on the warm marble enjoying the sun. Seems appropriate that they be the unofficial guardians of the dead - after my experience in Istanbul (see earlier entry) I'm convinced all cats are the spawn of the underworld.